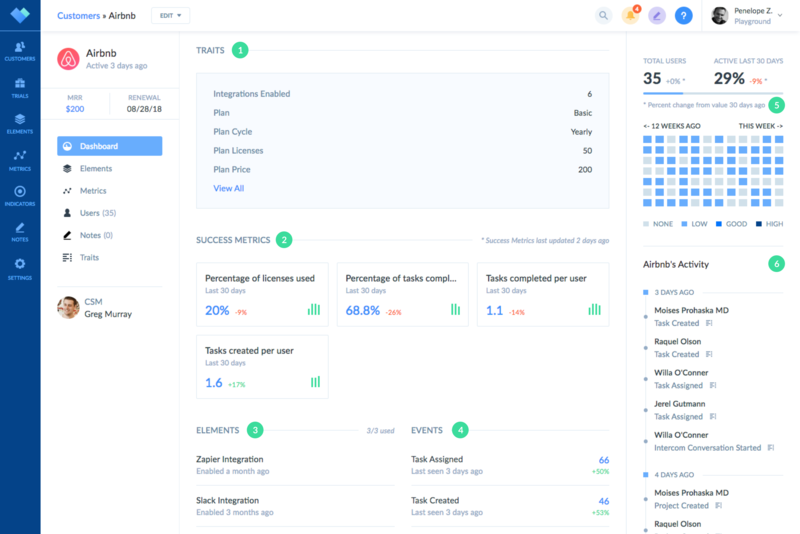 Every customer has a dedicated dashboard in Vitally that gives you a high-level overview of that customer's current engagement with your product. 5. A heatmap showing the breakdown of daily active user percentage for every day over the last 12 weeks. Once you are ready to dig deeper and analyze trends based on the customer's product usage, the Metrics section of the dashboard allows you to view the customer's historical performance in both their Success Metrics and any individual event. Success Metrics are graphed based on the value of the Success Metric for each day. Events, on the other hand, graph the total number of times the event was sent by any of the customer's users for each day. While Vitally mostly focuses on analytics and reporting at the customer level, you can view a high-level overview of each user's engagement with your product. To do so, either navigate to the customer's Users section and click on any user, or search for a specific user via the global search functionality. Their total number of sessions. Put another way, this is the total number of days the user has used your product. The last date/time the user used your product. A 12-week 'heatmap' showing the unique set of days the user used your product. A timeline of recent events sent by the user.